To being vaping, at VapingZone we have a variety of E-Cig starter kits. 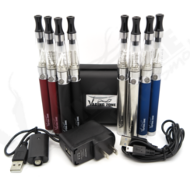 We have VZ eGo CE4+ kits, VZ eGo T2 E-Cig kits, and 510 E-Cigarette kits. For our pipe and cigar aficionados, VZ also has the E-Cigar and E-Pipe to give the ultimate experience of vaping. The eGo e-cigarette starter kits for vaping with an eGo e-cigarette are the VZ eGo CE4+ E-Cig Kits. Consider the VZ eGo CE4+ Pass-Through 900mAh E-Cig starter kit which includes 2 eGo pass-through batteries with a 5-click safety feature, 2 eGo CE4+ Clearomizers, 1 USB charger and 1 wall adapter. So pick your eGo e-cigarette starter kit and Don’t Smoke, Vape!